Are you looking for a professional and experienced Hausa translator for either Hausa to English translation or English to Hausa translation? Sulaiman Ibrahim (Katsina) is a Hausa translator and also a native speaker of the Hausa language. 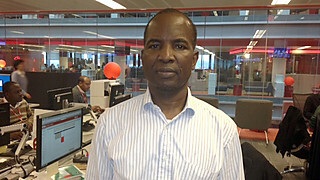 He has over twenty years experience as a Hausa translator, Hausa writer and Hausa presenter with the Hausa Service of the BBC World Service, which involves a lot of English to Hausa translation and Hausa to English translation. Also, for BBC Academy, he has produced video and text teaching Hausa translation, grammar, pronunciation, orthography, writing for radio, new words etc. Novels - Mallakin Zuciyata (Winner 1st Prize of Northern Nigeria Publishing Company competition), Turmin Danya (Winner 1st Prize of Federal Department of Arts and Culture, Nigeria, competition) and Tura ta kai Bango. Hausa to English translation: University of London, Human Rights Watch, Equal Access, Films of Record, October Films, Bhat Murphy Solicitors, etc. English to Hausa translation: Meridian International Communications, VSI, K-International, Fladgate Solicitors, etc.